I'll make no bones about it. 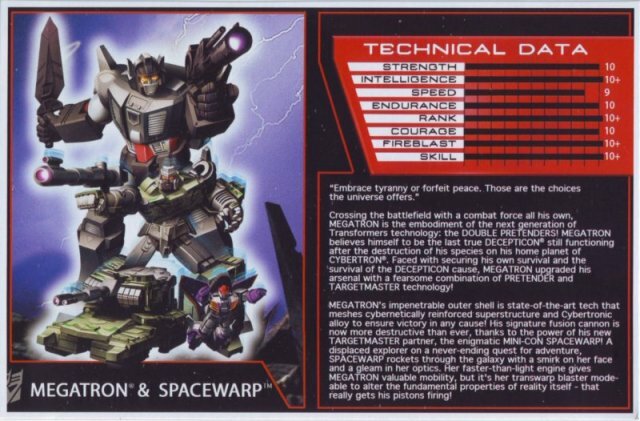 I want a Pretender Megatron (and the Optimus and Oilmaster as well, but I'm talking about Megatron here). Full stop, he could have been anyone else. Just as long as it had that sweet reuse of the Grand Maximus shell. That was a great use of the mold and in the dark colors just looks great. When the TFCC's final year of existing brought this out to play, I was amazed. I really wanted to subscribe to the subscription service to get it, but alas, it was not to be. Sometimes money doesn't always fold the way you'd like it, and it didn't fold in the favor of getting this guy. Really, it could have been anybody in that shell and I'd been sold (though Spacewarp is a really great idea). 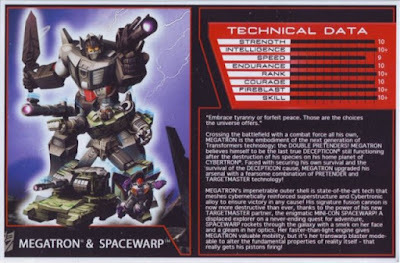 Anybody who reads Zone Base knows I'm a Pretender fan and at the time those new Pretenders from the TFCC was a siren song. Fortunately Primemasters came along and gave me Pretenders in a new flavor. Unfortunately, there's not enough of them. I want like, billions of them.